St. George's Church. Designed by John Bowden. 1816. Ceiling designed by W. J. Barre (1867). Belfast, Northern Island. Photograph and text by Philip V. Allingham 2006. This image may be used without prior permission for any scholarly or educational purpose. The site of St. George's Church marks the very beginning of Belfast. It is the place where settlement began and which gave the city its name. There are records of a chapel at Beal Feirste (Irish for "the sandy ford at the mouth of the Farset") going back almost 1,000 years. A small chapel belonging to the Church of Sancles (Shankill) stood here. It was used by pilgrims waiting to cross the mud flats, which were dangerous at high tide. Here they could pray to have a safe crossing of the River Farset. The present church is a large and elegant building designed by John Bowden of Dublin. 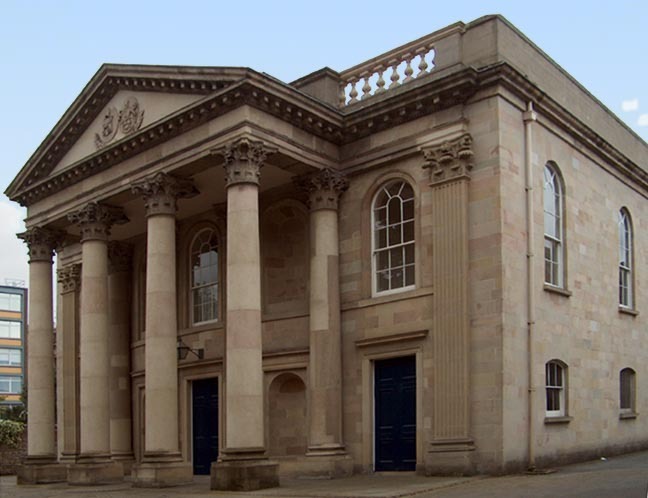 Completed in 1816, it was built as a chapel of ease to house the overflow from St. Anne's parish church nearby, before St. Anne's Cathedral was built on that site. The church is constructed from hard-wearing, honey-coloured Scrabo sandstone [seen on many of the city's best buildings, including the Albert Memorial Clock and the Custom House] and its four columned Corinthian porch and portico came from the Earl Bishop of Derry's unfinished Ballyscullion House near Castledawson. It was the first cargo to be brought by the Lagan Canal. Internally, there is a gallery on three sides and with the addition of nave pews, it provides seating for over 500 people. In 1865 the plain ceiling was taken down and the exposed trusses were decorated in bright colours, under the direction of the eminent architect, W. J. Barre. Heatley's book on Belfast's historic buildings adds that, during the Parliamentary Civil War of the early 1640s, when Belfast was loyal to King Charles the First, Cromwell despatched Colonel Robert Venables to the scene, where, meeting little opposition, he converted the "Chapel of the Ford" into a military citadel. The old church near the town docks was demolished 1774, and replaced by the present handsome Palladian design; the present church opened for morning worship on 16 June 1816. In the period when the church was under construction, the old cemetery nearby was removed; among the graves relocated were those of a prominent local family named "Pottinger," after whom the "Pottinger Entry" up the street is named — a Pottinger negotiated the agreement for China to cede the island of Hong Kong to the British at the conclusion of the First Opium War.